I take it easy in the days leading up to the race, reducing my workouts and indulging in pasta and bread and my favorite power food––potatoes––to the extent that by the time race day rolls around I’m feeling a bit edgy and *too rested. * At the same time, I’m worried that (as typical) I won’t be able to fall asleep but somehow I manage to get between 6 and 8 hours of sleep, a huge improvement over the 3 that I raced on back in June. The drive up to Malibu at 5am is tense and exciting in the morning darkness. I crank the tunes on Journey, Muse, and Kanye West and follow the pilgrim’s trail of other cars with bikes fastened on to the back. They bear the same race bib as my little bike and I smile. We’re all going to the same place. Because the Zuma Beach parking lot is huge and the attendants direct us to the closest available spots, the other racers and I end up forming a mass exodus toward the transition point, a good half mile away. I think about riding my bike like the other daredevils in the darkness, but I abstain, wanting to avoid the chance of injury before the race even begins. Instead I walk like everyone else and reach transition with about 15 minutes to set up. I rack my bike and unpack my bag, all the while enduring race director’s threats of disqualification if we don’t clear out by the cut off time. No matter. It’s not my first rodeo and I’m feeling much calmer than I did for my little sprint 3 months ago. I pull on my swim cap (pink again, race directors seem to like placing young women in pink neoprene caps), grab my goggles and wetsuit and head to the beach. Despite all of the urgings by the officials to hurry up, I’m learning that these races tend to involve a lot of “Hurry Up and Wait” (at least for anyone not a male between the ages of 14 and 40). My wave’s start time, for women between 14 and 34 is a good 40 minutes after the youngest and fastest of the men begin. To be honest, it’s probably best to avoid that much testosterone whenever possible. Finally our time comes. The nerves settled in as I step up to the line and wait for the starter’s pistol. The pre-race dip I had taken let me know that the water is cold, but not unbearable. The surf is similar, churning out a few big waves every now and then, but mostly just light splashes. The conditions are nothing compared to the routine Wednesday mornings I spend down at Tower 26. The cannon fires and we take off for the water, me running faster than I probably should but it’s fun! I’m in a race! I think with the same childhood glee that fueled elementary school Fun Runs. I had come to Malibu with the attitude of viewing it as a long workout, complete with snacks and crowds of people to cheer you on. There’s no better way to celebrate a beautiful weekend in a beautiful place than by taking in its natural terrain. Once I hit the water I feel the strange, paradoxical feeling of being warm within my wetsuit but cold throughout. My breathing seizes slightly in that familiar way as the saltwater tries to make its way down my throat. I know this part, feel it every week. Swim to the first buoy and it’ll feel better. If it doesn’t, then swim to the second buoy anyway. For the first few yards I flail and splash but before long I fall into a smooth rhythm. The current is noticeable and I have to sight frequently to stay on course by looking up every other stroke. Then I come to the first of the green caps––the men who started in the wave ahead of us and I know that I’m moving in the right direction and even passing a few people. Of course I’m passed as well, as typical. The slightly older women between 34 and 40 started in the wave behind us, and a few of them cruise right through us. But I’m still doing what I do well, feeling the potatoes working their magic. I pass the fourth buoy out of six and realize that the swim is already 2/3 of the way over. I keep plugging along. Finally the finish comes. I pop out of the water, reaching back with my hand to unzip my wetsuit and I have my arms out before my feet even hit the sand. Thanks again to weekly Tower 26 workouts, I’m able to zoom out of the water and run up to the transition line. To my right I hear a voice call my name––a pair of lovely ladies from the swim group who’ve been kind enough to hang around and cheer me on. It’s great to see them. I zip into transition and prepare for the bike. Over the loudspeaker I hear the race director announcing the arrival of the first of the men’s cyclists back into transition and, of course, it’s elite Ironman Champion Chris McCormack. It hits me again how awesome it is to race (somewhat) alongside triathlon royalty and I hope to get a glimpse. I race up to the mount line and get going. I see Chris McCormack ride opposite me on his way in as I’m making my way out. I let out a little whoop and then get going on my race. His is almost over, mine is still beginning. And this is where it all gets hard. Bike is without a doubt my weakest sport and for some reason I find it the hardest to train for. Something about hills and cars and clipless pedals and the fear of death make it an unpalatable sport for me, but I know that it’s worth it for moments like these when the breeze hits your face and you crouch over for a downhill straight away. I know, I know, I need to train more. Mile 3. I look at my watch and see that 12:00 minutes have passed. Not terrible but nowhere near impressive speeds. At this pace I’m looking at a cozy ride somewhere in the neighborhood of 1 hour, 40 minutes for all 24.8 miles. (Pool workouts make you great at doing quick mental math under intense pain). 1 hour and 40 minutes. I’ve done 12:00 and I’m already ready for the run. I ward off the sinking feeling that I’m about to endure feelings I’ve never felt before and instead focus on making it to Mile 4 then Mile 5 and one by one until I’m done. And that’s what I do. Mile 6 passes. Mile 9. I bypass the entrance to Mulholland Highway with its 8-mile climb and I thank God that that level of torture is not in store for me today. I ride up the hills, I ride down the hills. I get passed on my left. I get passed on my right. My quads burn, then my hammies burn. Before long my calves and feet burn but I know that it comes with the territory and I have to keep going. I pass through phases of delirium and ecstasy where the race feels light and fun and amazing one moment then dark and brooding and torturous the next. At one point I sing a bit of Billy Joel’s “Piano Man” to help pass the time and take my mind off the pain. It occurs to me that if I have enough breath left to sing that I should probably be going harder, but the problem is my legs, not my lungs and that engine is working as hard as it can. It’s slightly frustrating that my energy level is so high but that the output level from my legs is comparatively low. There’s only so much they can do, so I won’t ask too much. I’m thankful for the full night’s sleep. The scenery, of course, is beautiful. Malibu coast on one side of me with mountains on the other. I think I was wrong when I declared Santa Monica to be the tip of heaven when it is in reality, Malibu. It’s obvious why they named it the City of Angels. I round a curve and see Zuma Beach in my sights, the white tents of transition, the orange flags from the swim finish. I estimate about 4 or 5 miles. Totally doable. I keep my eyes glued to tiny spots just a few feet ahead to avoid seeing the looming hills in the distance. This isn’t the hardest thing I’ve ever done, but it’s starting to rank fairly high. Then I just keep going. There’s no secret, inch by inch I make it back to transition and lace up for the run. I force down a couple of electrolyte gummy gels and a swig of water. I tie up my hair and reset my watch. I’ve got 6 miles of ahead of me and they won’t run themselves. My legs are in near revolt at the moment, especially my ankles, tensing in ways I’ve never felt. They’re mad at me, I know, but I tell them that they can do this. Fortunately my heart and lungs still feel great, so I tell myself to listen to my heart, not my legs. Mile 1 passes at a moderate race pace, even a little fast for what I would normally push for 6 miles. During Mile 2, I question my sanity. Why, why, why did I sign up for this? What’s the point? I need to stop before I seriously hurt myself. My back hurts. Normal people don’t do this! This is not okay! My legs want to leave my body and fly but again, I tell them to shut up. I have ground to make up after losing so much time after the bike and I want to finish strong. Mile 3 shows me the light at the end of the tunnel. The sweet volunteer kids offer hydration. The little boy rears back with two cups and soaks me. The girl next to him yells at him, saying that I wasn’t asking to be splashed but I smile and laugh. It feels great. People up and down the course cheer each other on and I try to return the favor when I have enough breath left to do so. No singing for me this time. I hit Mile 4 and fist pump in the air. Just like the swim, this is now 2/3 of the way over. 2 miles is easy breezy. A victory lap. Smooth sailing into Mile 5. Now I’m really happy. Not happy enough to run faster but happy enough to know that it will soon be over and that I will have done it. “Last mile!” I shout to the woman next to me. “Last mile!! !” I’ve gone a bit loopy in my exhaustion. “Unnnhh…” the woman replies. So has she. Then I remember with a slow dawning horror that I’ve been screwed over by the metric system. I’m running a 10K which equates to 6.2 miles, not just 6. The difference is minuscule after the scale of the race but I’m ready to stop running on principle. But then the end zone comes into view, lined with spectators who call my number and tell me to keep smiling (it’s more of a grimace than a smile but I can no longer control these things). They yell and shout and clap and finally I’m able to pick up the pace. My legs whip forward and I round the corner for the finish. The crowd roars. 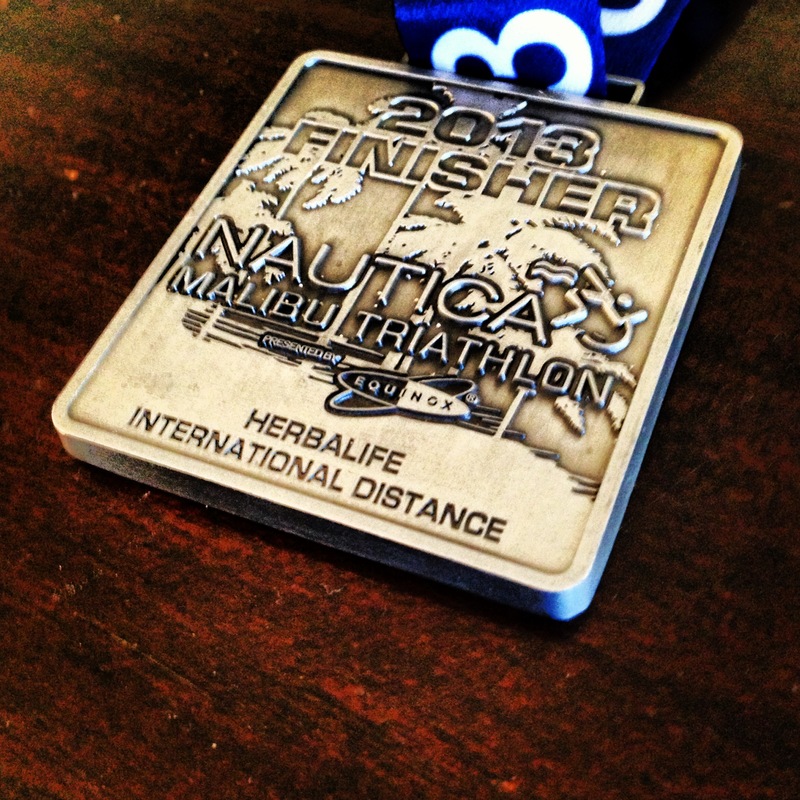 A volunteer places a medal around my neck and I gladly accept a bottle of water. It’s done but takes a moment to dawn on me that the moment I’ve wanted for the past two hours has finally arrived. I did it, and I did great. 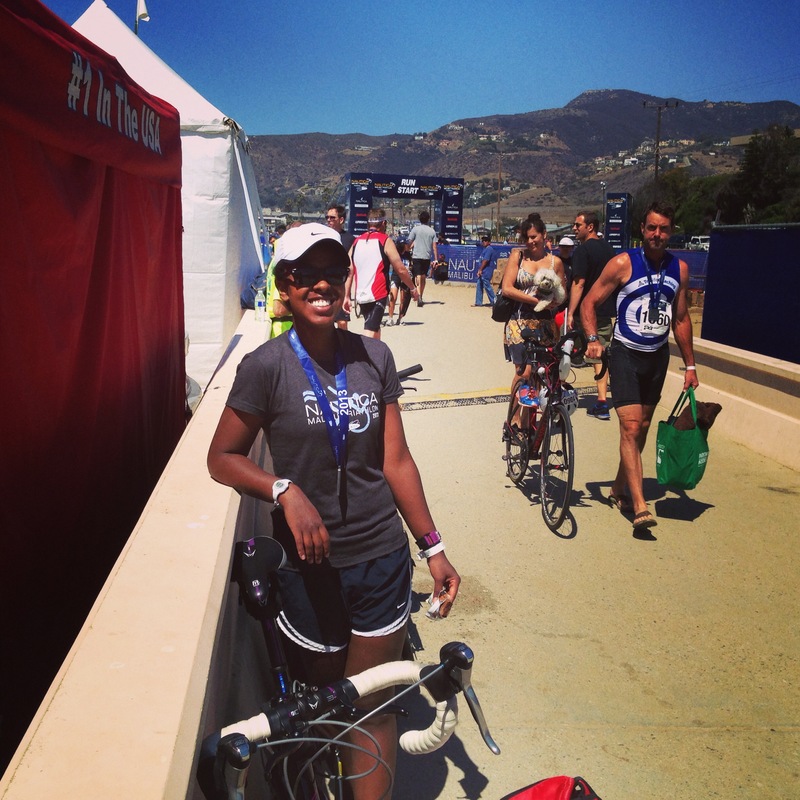 Finishing my first race of legit triathlon distance was awesome, despite the story above. I was fortunate enough to be joined by team mates from Tower 26 who shouted my name from the sidelines and gave me thumbs up along the course. Even though triathlon is an individual competition, it often feels like a team sport. The last words I heard as I crossed the finish line during my first race in June — “Triathlon — it’s a lifestyle.” Yes, yes it is. And I’m looking forward to it. Next Article First Marathon Recap — 2014 LA Marathon!